St Joseph’s College, Hunters Hill, has long been renowned for providing a first-rate Catholic secondary education for boys according to the tradition of Saint Marcellin Champagnat and the Marist Brothers. Day students arrive by 8.00am each day and leave at either 5.00pm or approximately 8.00pm. After daily classes day students take part in sports training or other co-curricular activities. Boys staying on until 8.00pm have their evening meal, shower and do their evening study at the College. Day students have their own cupboard in the boarding areas and fully share in the life and activities of the College. 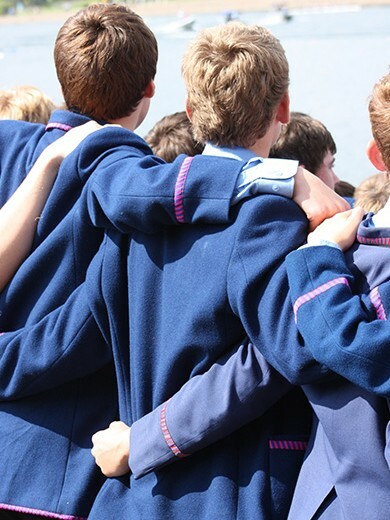 There is no division between day students and boarding students – all boys are part of the one, united College family. Weekly boarding students leave St Joseph’s to the care of their parents after they have completed their full sporting commitment on Saturday. They return to the College Sunday evening or Monday morning. In many ways, weekly boarding gives boys the best of both worlds. During the week they live at the College, where they benefit from structured study and access to first-class facilities and resources. On weekends, weekly boarders go home and enjoy quality time with their families. Many families find weekly boarding is a flexible enrolment option that offers a perfect balance of study, recreation and home. St Joseph’s provides boarders with specially designed facilities to make their time at the College comfortable, enjoyable and productive. Each Year 12 boarder has his own comfortable study-bedroom, with access to shared relaxation and recreation areas. The Year 12 bedrooms and boarding area underwent a complete refurbishment in 2009, and provides students with modern, functional spaces for both living and studying. Borders in Years 10 and 11 live in purpose-built residential blocks. Junior boarders (Years 7-9) live in the main sandstone building, where the traditional dormitories have been refurbished and modernised to create a relaxed and homely atmosphere. Applications for enrolments for boarding, weekly boarding and day students are accepted from parents/guardians in Australia and from overseas who agree to uphold the aims of the College and who complete the required documentation. Applications are welcomed from both Catholic families and families which may not be Catholic but which identify with and support the aims of education within a Catholic school. In making enrolment decisions, the College will take into account those cases where the applicant is the sibling of a student already enrolled, or the son of an Old Boy of the College. Applicants previously enrolled at another Marist school will also be favourably considered. St Joseph’s is proud of its strong affinity with rural NSW, and country applications, particularly those from families in isolated situations, are positively encouraged. For information on enrolling an international student at the College, go to the international student section of this website. View the St Joseph’s College Enrolment Policy.